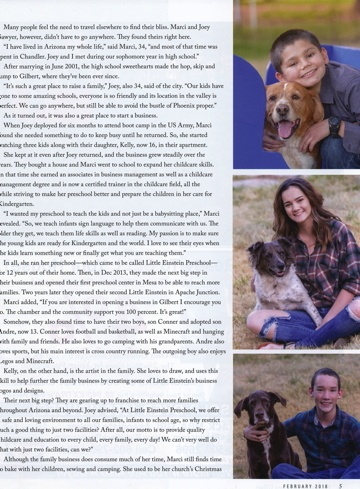 Joey Sawyer and his family are featured prominently in the February issue of Neighbors of SW Gilbert magazine, a regional community-focused periodical. 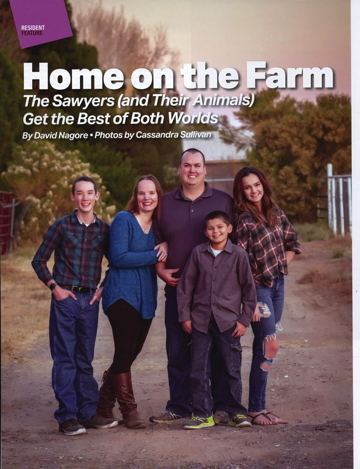 The article “Home on the Farm – The Sawyers (and Their Animals) Get the Best of Both Worlds” by David Nagore with photos by Cassandra Sullivan tells the story of how Joey and his wife Marci became high school sweethearts here in Arizona, married, survived military service, and while growing a family created thriving businesses here in the East Valley. With Marci’s two Little Einstein Preschool locations and Joey’s computer security firm I.T. Done Right, this husband and wife team has established a reputation supporting other families and business owners throughout the metro Phoenix area. As a member of the Gilbert Chamber of Commerce, the I.T. Done Right team can attest to the incredible support received from the Chamber staff and the local business community at large. You can find the magazine available at local businesses around the Gilbert area. We encourage you to grab a copy and read the full story about the Sawyer family dynamic duo of business entrepreneurs. Mr. Sawyer is a co-founder of ITDR Business Solutions, LLC, a regional business-to-business managed computer security services provider in Arizona, operating under the I.T. Done Right brand. With over three decades of technology business experience, our founders apply proven guidance to everything we do as a company. To learn more about I.T. 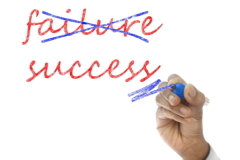 Done Right visit www.itdrsolutions.com/#about and ProtectSMB.